I have been busy adding a little touch of Valentines Day to Lemon Lane Cottage. Having the memory of putting away Christmas fresh in my mind, I don't go overboard. Just a few trinkets and signs and what's left of the roses from the garden. 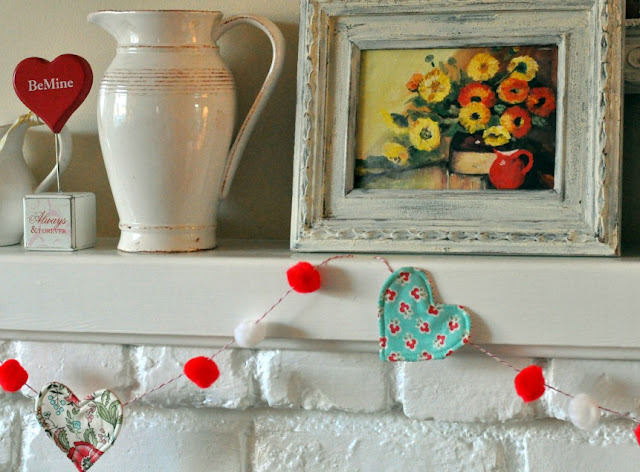 I thought the fireplace needed a little pop of something, so I made this cute pom-pom and quilted heart garland. Since I can never make just one of anything...I listed a couple of them in my shop. The hearts are reversible and stuffed with quilt batting which allows them to lie flat. I have a couple in turquoise and red and a couple in pinks and red. Will you pepper your house with Valentine love this winter? Or will just wait until spring for a pop of color? Your garland is so pretty and such a nice touch on your mantle, Patty. The pom poms are such a clever addition and work so well with the patterned hearts. I love how you can just whip up something that occurs to you! ADORABLE....so pretty with the white chimney. Love it! The fabric and pom poms...just great! your garland is so cute, we are in the middle of summer here in Australia and I am decorating our mantle with beautiful flowers from our garden. They don't last long in the hot weather though. I use to decorate for all the holidays when our girls were growing up. Now that they are hardly Home any more, I don't do as much. I may put out some wooden hearts my guy made for me. They are BIG and Chunky and he painted them a deeper shade of red. Great garland! Oh, Patty, I just adore that heart and pom-pom garland! I don't have a mantle (or anywhere else) to hang it from though. I'll just have to admire it in pictures on your blog. 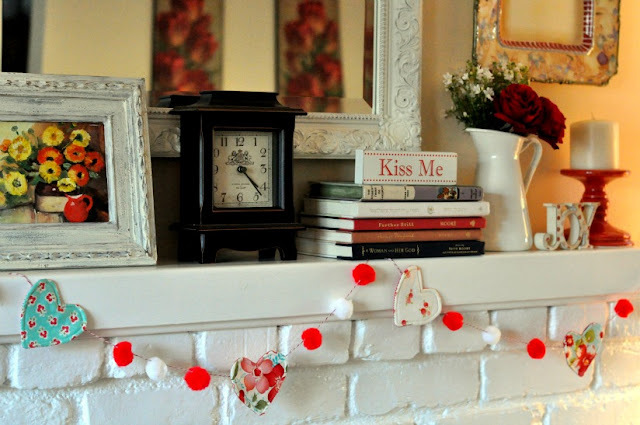 I do a little decorating for Valentine's Day, but just not in the mood yet since it seems I just finished taking Christmas stuff down! Color is part of my decor year round, Patty! Love your garland! I'm afraid I have MORE THAN PEPPERED my house with Valentine decor. I'll regret that when I have to put it away, but for now, I'm enjoying it!! I'm more than ready for some red! I am putting up quite a few Valentine decorations. 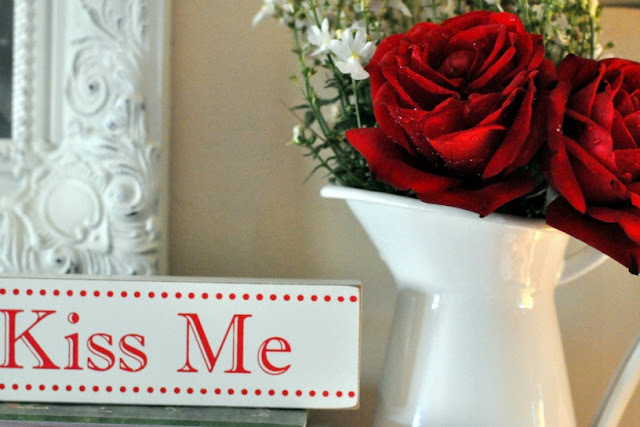 Your pictures make me want to get out my Valentines decorations and put them up... hopefully soon (before Valentine's Day)! fun, fun...it sure makes one smile, enjoy! Very pretty garland! I've never really decorated for seasons or holidays other than Christmas, but I'm thinking I might start with just a few little things to celebrate and brighten the house. 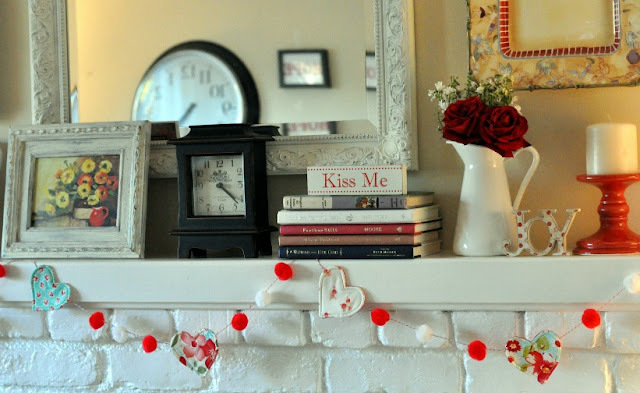 Your mantle looks lovely.